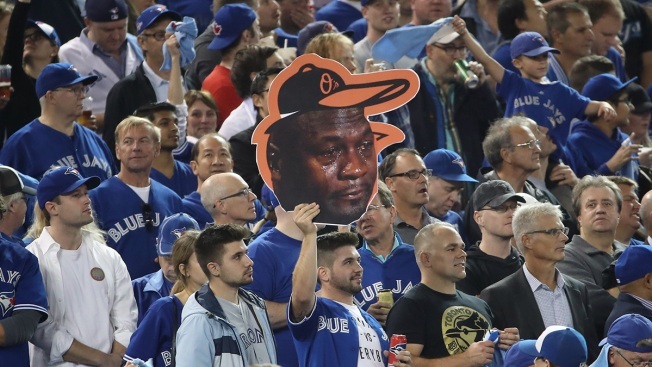 This October 4, 2016, file photo shows a Toronto Blue Jays fan holding up a cardboard cutout of the crying Michael Jordan meme before the start of the game against the Baltimore Orioles in the American League Wild Card game at the Rogers Centre in Toronto, Canada. Well that escalated quickly: The memes that dominate your Facebook feed will soon be etched in America's official historical record. The American Folklife Center at the Library of Congress has announced the creation of the library's Web Cultures Web Archive Collection, according to an announcement last week. The sampling of memes, reaction GIFs and image macros — funny, often wittily captioned images that are some of the most viral things on social media — represents how communications are increasingly shaped by the internet, the library said. "The proliferation of smart phones, tablets and wireless internet connection has positioned networked communication as a space where people increasingly develop and share folklore," said Elizabeth Peterson, director of the American Folklife Center, in a statement. "This effort will help scholars 25 and 100 years from now have a fuller picture of the culture and life of people today." The archive will also collect records from websites that use icons like emoji and catalog newly established vernacular, such as Urban Dictionary and Know Your Meme. The American Folklife Center, created by Congress in 1976, aims to document cultural practices and record digital culture, which until recently was done by printing out screenshots of internet sensations on paper. With the new archive collection on the Library of Congress website, content can be kept up to date and used for research across disciplines. "What's happening on the internet — all the situated vernacular, all the creative expression, all the remix, all the slang; every in-joke and hashtag and portmanteau — is folklore,” internet scholars Whitney Phillips and Ryan M. Milner said in a recent interview with a College of Charleston communciations professor who studies memes.